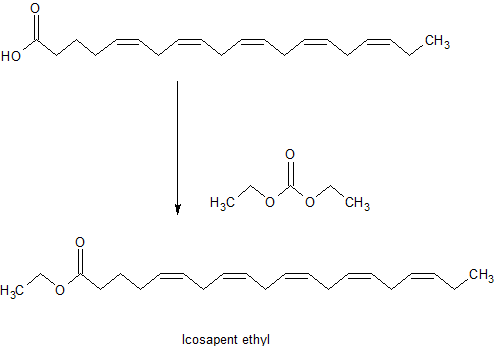 Icosapent ethyl or ethyl eicosapentaenoic acid is a synthetic derivative of the omega-3 fatty acid eicosapentaenoic acid (EPA). It is used as adjunct therapy for severe hypertriglyceridemia (TG levels > 500 mg/dL). FDA approved on July 26, 2012. In 2000, Amarin licensed exclusive U.S. rights to icosapent ethyl ester from the Scottish company Laxdale, and acquired the company in July 2004. In 2015, the product was licensed to Eddingpharm by Amarin for the development and commercialization in China, Hong Kong and Taiwan. Fast-track status has been granted in the U.S. for the treatment of HD. Orphan drug designation was assigned to the compound for this indication in both the U.S. and E.U. Ethyl eicosapentaenoic acid (E-EPA, icosapent ethyl) is a derivative of the omega-3 fatty acid eicosapentaenoic acid (EPA) that is used in combination with changes in diet to lower triglyceride levels in adults with severe (≥ 500 mg/dL) hypertriglyceridemia. This was the second class of fish oil-based drug to be approved for use as a drug and was approved by the FDA in 2012. These fish oil drugs are similar to fish oil dietary supplements but the ingredients are better controlled and have been tested in clinical trials. The company that developed this drug, Amarin Corporation, challenged the FDA’s ability to limit its ability to market the drug for off-label use and won its case on appeal in 2012, changing the way the FDA regulates pharmaceutical marketing. E-EPA is used in addition to changes in diet to reduce triglyceride levels in adults with severe (≥ 500 mg/dL) hypertriglyceridemia. Intake of large doses (2.0 to 4.0 g/day) of long-chain omega-3 fatty acids as prescription drugs or dietary supplements are generally required to achieve significant (> 15%) lowering of triglycerides, and at those doses the effects can be significant (from 20% to 35% and even up to 45% in individuals with levels greater that 500 mg/dL). It appears that both eicosapentaenoic acid (EPA) and docosahexaenoic acid (DHA) lower triglycerides, however, DHA alone appears to raise low-density lipoprotein (the variant which drives atherosclerosis; sometimes very inaccurately called: “bad cholesterol”) and LDL-C values (always only a calculated estimate; not measured by labs from person’s blood sample for technical and cost reasons), whilst EPA alone, does not and instead lowers the parameters aforementioned. There are other omega-3 fish oil based drugs on the market that have similar uses and mechanisms of action. Omega-3 acid ethyl esters (brand names Omarcor or Lovaza, Omtryg, and as of March 2016, four generic versions. There are many fish oil dietary supplements on the market. There appears to be little difference in effect between dietary supplements and prescription forms of omega-3 fatty acids, but EPA and DHA ethyl esters (prescription forms) work less well when taken on an empty stomach or with a low-fat meal. The ingredients of dietary supplements are not as carefully controlled as prescription products and have not been fixed and tested in clinical trials, as prescription drugs have, and the prescription forms are more concentrated, requiring fewer capsules to be taken and increasing the likelihood of compliance. Special caution should be taken with people who have with fish and shellfish allergies. In addition, as with other omega-3 fatty acids, taking E-EPA puts people who are on anticoagulants at risk for prolonged bleeding time. The most commonly reported side effect in clinical trials has been joint pain; some people also reported pain in their mouth or throat. E-EPA has not been tested in pregnant women is rated pregnancy category C; it is excreted in breast milk and the effects on infants are not known. After ingestion, E-EPA is metabolized to EPA. EPA is absorbed in the small intestine and enters circulation. Peak plasma concentration occurs about 5 hours after ingestion and the half-life is about 89 hours. EPA is metabolized mostly in the liver like other dietary fatty acids. EPA, the active metabolite of E-EPA, like other omega-3 fatty acid based drugs, appears to reduce production of triglycerides in the liver, and to enhance clearance of triglycerides from circulating very low-density lipoprotein (VLDL) particles; the way it does that is not clear, but potential mechanisms include increased breakdown of fatty acids; inhibition of diglyceride acyltransferase which is involved in biosynthesis of triglycerides in the liver; and increased activity of lipoprotein lipase in blood. E-EPA is an ethyl ester of eicosapentaenoic acid, which is an omega-3 fatty acid. In July 2012, the US Food and Drug Administration approved E-EPA for severe hypertriglyceridemia as an adjunct to dietary measures; Amarin Corporation had developed the drug. E-EPA was the second fish-oil drug to be approved, after omega-3 acid ethyl esters (GlaxoSmithKline‘s Lovaza which was approved in 2004) and sales were not as robust as Amarin had hoped. The labels for the two drugs were similar, but doctors prescribed Lovaza for people who had triglycerides lower than 500 mg/dL based on some clinical evidence. Amarin wanted to actively market E-EPA for that population as well which would have greatly expanded its revenue, and applied to the FDA for permission to do so in 2013, which the FDA denied. In response, in May 2015 Amarin sued the FDA for infringing its First Amendment rights, and in August 2015 a judge ruled that the FDA could not “prohibit the truthful promotion of a drug for unapproved uses because doing so would violate the protection of free speech.” The ruling left open the question of what the FDA would allow Amarin to say about E-EPA, and in March 2016 the FDA and Amarin agreed that Amarin would submit specific marketing material to the FDA for the FDA to review, and if the parties disagreed on whether the material was truthful, they would seek a judge to mediate.
.  S13 of the refined fish oil fatty acid ethyl ester prepared by esterification process: step S12 is added to the fish oil refining prepared in mass ratio of 0.5% of sodium ethoxide, and a mass ratio of 0.5 in ethanol (ethanol: fish oil refining ), 40 ° C water bath for 1 hour, 1% (by mass) citric acid (citric acid: fish oil refining), standing layer, the upper layer and the liquid was washed with hot deionized water, standing layered repeated three times to give fatty acid ethyl ester.
.  S15 of the fatty acid ethyl ester after enzymatic extraction separation processing: The fatty acid ethyl ester obtained in step S14 using Penicillium expansum lipase enzyme, 4% of the amount of enzyme added,, reaction temperature 40 ° C , reaction pH of 10, speed 150 revolutions / min, hydrolysis time 4h, to obtain fatty acid glycerides.
.  S25 of the fatty acid ethyl ester after enzymatic extraction is carried out the separation treatment: The procedure of Example 1 with reference to embodiment 15; wherein 10% of the amount of enzyme added, reaction temperature 50 ° C, pH 8 hydrolysis, speed 300 rpm / min, hydrolysis time 12h, to obtain fatty acid glycerides.
.  S35 of the fatty acid ethyl ester after enzymatic extraction separation processing: The procedure of Example 1 with reference to embodiment 15; wherein 20% of the amount of enzyme added, reaction temperature 60 ° C, a pH of 6.5 hydrolysis, speed 300 rpm / min, hydrolysis time 24h, to obtain fatty acid glycerides.
.  S3 of refined fish oil fatty acid ethyl ester prepared by esterification process: Step 1, Example 13 process embodiment with reference, to obtain fatty acid ethyl ester. In recent years, highly unsaturated fatty acids such as eicosapentaenoic acid (EPA) and docosahexaenoic acid (DHA) have been clarified for their pharmacological effects and are used as raw materials for pharmaceuticals and health foods. Since these polyunsaturated fatty acids have a plurality of double bonds, it is not easy to obtain them by chemical synthesis. Therefore, most of industrially used highly unsaturated fatty acids are produced by extraction or purification from marine organism-derived materials rich in polyunsaturated fatty acids, such as fish oil, etc. However, the content of highly unsaturated fatty acid is not necessarily high, because the biological material is a mixture of various kinds of fatty acids having different numbers of carbon atoms, number and position of double bonds, constitutional ratio of stereoisomers, and the like. For this reason, conventionally, it has been required to selectively purify a target highly unsaturated fatty acid from a biological raw material. Patent Document 1 discloses a supercritical gas extraction method after a thin film distillation method when a raw material containing a highly unsaturated fatty acid or an alkyl ester thereof is treated by a thin film distillation method, a supercritical gas extraction method and a urea addition method A method for purifying a highly unsaturated fatty acid or an alkyl ester thereof is described. In Patent Document 2, a raw material containing a highly unsaturated fatty acid such as EPA is subjected to vacuum precision distillation treatment, and the resulting EPA or a fraction containing a lower alcohol ester thereof is mixed with an aqueous silver nitrate solution, whereby a high purity eicosapentaene A method of purifying an acid or a lower alcohol ester thereof is described. It is described that the condition of the vacuum precision distillation is a pressure of 5 mmHg (665 Pa) or less, preferably 1 mmHg (133 Pa) or less, 215 ° C. or less, preferably 210 ° C. or less. Further, Patent Document 3 discloses a process for producing eicosapentaenoic acid or an ester thereof having a concentration of 80% or more by gradually distilling a raw material containing a highly unsaturated fatty acid or an alkyl ester thereof using a distillation tower having three or more stages Is described. It is described that the condition of the distillation is 10 Torr (1330 Pa) or less, preferably 0.1 Torr (13.3 Pa) or less, 210 ° C. or less, preferably 195 ° C. or less. However, highly unsaturated fatty acids having higher concentrations and purities than those obtained by the above-mentioned conventional methods are required as raw materials for pharmaceuticals and health foods. There are cis and trans isomers in highly unsaturated fatty acids. Most of the highly unsaturated fatty acids in vivo are cis, however, they may be converted from cis form to trans form by heating or the like at the stage of purification from biological origin materials (Non-Patent Document 1). Therefore, polyunsaturated fatty acids conventionally purified industrially from biologically derived raw materials contain a certain amount of trans isomer. However, trans fatty acids have been reported to increase health risks, especially LDL cholesterol levels, and increase the risk of cardiovascular disease. In the United States and Canada, foods are obliged to indicate the content of trans fatty acids. Therefore, there is a need for a highly unsaturated fatty acid-containing composition which not only contains the targeted highly unsaturated fatty acid at a high concentration as a raw material for pharmaceuticals and health foods but also contains a trans fatty acid content as low as possible . However, conventionally, purification of highly unsaturated fatty acids has not been conducted focusing on the stereoisomer ratio. Hereinafter, the present invention will be described in more detail by way of examples, but the present invention is not limited to only these examples. In the following examples, the method of composition analysis of highly unsaturated fatty acids and the method of quantitating stereoisomers are as follows. 9 μL of the measurement sample was diluted to 1.5 mL of n-hexane, and the content ratio of each fatty acid and the content ratio of isomers were analyzed using a gas chromatography analyzer (Type 6890 GC, manufactured by Agilent Technologies) under the following conditions did. The results are expressed as mass% converted from the area of the chromatogram. Column: DB-WAX 0.25 mm × 30 m manufactured by J & W Co., column temperature: 210 ° C.
He flow rate: 10 ml / min, DET temperature: 260 ° C.
The isomer ratio in the target highly unsaturated fatty acid was obtained by the following formula. Raw material: 1000 mL of anhydrous ethanol solution in which 50 g of sodium hydroxide was dissolved was added to 1 kg of sardine oil, mixed and stirred at 70 to 80 ° C. for 1 hour, then 500 mL of water was added and mixed well, 1 It was left standing for a while. The separated aqueous phase was removed and the oil phase was washed several times with water to neutralize the washings to give 820 g of ethyl esterified sardine oil. As shown in Table 1, the composition of the sardine oil was 44.09% (mass%, hereinafter the same) of eicosapentaenoic acid (EPA), 1.52% of eicosatetraenoic acid (ETA), 1.52% of arachidonic acid (AA) 1.77%, docosahexaenoic acid (DHA) 6.92%. Also, the trans isomer ratio in EPA was 1.23%. Step (1) 160 ml of n-hexane was added to 300 g of the ethyl esterified sardine oil prepared above, and the mixture was stirred well and dissolved. To this was added 500 mL of an aqueous solution containing 50% by weight of silver nitrate, and the mixture was stirred under conditions of 5 to 30 ° C. After standing, the separated n-hexane phase was removed, and the aqueous phase was recovered. Step (2): 2000 mL of fresh n-hexane was added to the aqueous phase obtained in the step (1), and the mixture was sufficiently stirred at 50 to 69 ° C. to extract the fatty acid ethyl ester into n-hexane. After standing, the separated aqueous phase was removed and the n-hexane phase was concentrated. The crude fatty acid ethyl ester crude product contained in this n-hexane phase contained 74.54% EPA, 0.32% ETA, 0.17% AA and 14.87% DHA in total fatty acids as shown in Table 1 It was. Also, the trans isomer ratio in EPA was 0.19%. Step (3): The n-hexane phase containing the fatty acid ethyl ester obtained in the step (2) was maintained under conditions of a top vacuum degree of 1 Pa or less and a distillation temperature of 170 to 190 ° C. using a packed tower precision distillation apparatus While performing vacuum distillation to obtain a highly purified EPA ethyl ester-containing composition in a yield of about 60%. As shown in Table 1, this EPA ethyl ester-containing composition contained 98.25% of EPA, 0.43% of ETA, 0.21% of AA, and 0.05% of DHA in total fatty acids. Also, the trans isomer ratio in EPA was 0.45%. The yield of EPA in this example in which the steps were performed in the order of (1), (2), (3) was about 53%. steps (1), (2) and (3) were carried out in the same manner as in Example 1 except that the step (3) was carried out while maintaining the distillation temperature of 180 to 185 ° C., EPA ethyl ester-containing composition was obtained in a yield of about 58%. As shown in Table 1, this EPA ethyl ester-containing composition contained 98.29% of EPA, 0.40% of ETA, 0.32% of AA, and 0.05% of DHA in total fatty acids. Also, the trans isomer ratio in EPA was 0.28%, and the trans isomer was extremely small. EPA ethyl ester-containing composition was obtained in the same manner as in Example 1, except that the top vacuum degree was set to 13.3 Pa (0.1 Torr) in the step (3). As shown in Table 1, the composition contained EPA content ratio as high as 97.44% in the total fatty acid, but the trans isomer ratio in EPA was high (1.37%). EPA ethyl ester-containing composition was obtained by performing vacuum distillation (step (3)) of ethyl esterified sardine oil and then steps (1) and (2). The conditions of each step were the same as in Example 1. As shown in Table 1, this composition contained 95.05% EPA, 0.72% ETA, 0.50% AA, 0.21% DHA in total fatty acids, the trans isomer ratio in EPA was 1.55% Met. The yield of EPA in this comparative example in which the steps were carried out in the order of (3), (1) and (2) was about 31%, and the EPA yield greatly decreased as compared with Example 1. By changing the condition of the vacuum distillation in this Comparative Example (0.5 Pa, 185 to 195 ° C.), it was possible to raise the content of EPA in the total fatty acids in the composition to 98.12%, however, The rate further declined and the trans isomer ratio in EPA was 2.01%, further increased. step (3), the distillation temperature was 180 ° C. (Example 3), 190 ° C. (Example 4), 200 ° C. (Comparative Example 3), and the vacuum distillation time was A highly purified EPA ethyl ester-containing composition was obtained in the same manner as in Example 1 except that various changes were made and the trans isomer ratio of EPA in the composition was determined. The results are shown in Fig. 1. 1, in Examples 3 to 4 having a distillation temperature of 190 ° C. or less, the trans isomer ratio was less than 1% by mass, but in Comparative Example 3 having a distillation temperature of 200 ° C., the trans isomer The ratio exceeds 1% by mass. ^ Jump up to:a b Weintraub, HS (2014). “Overview of prescription omega-3 fatty acid products for hypertriglyceridemia”. Postgrad Med. 126: 7–18. doi:10.3810/pgm.2014.11.2828. PMID 25387209. Retrieved 20 April 2015. Jump up^ “Epanova (omega-3-carboxylic acids)”. CenterWatch. Retrieved 15 December 2014. Jump up^ Thomas, Katie (7 May 2015). “Drugmaker Sues F.D.A. Over Right to Discuss Off-Label Uses”. New York Times. Retrieved 17 May 2017. Sakshi Modgil on Flow Chemistry in Industrial Scale Organic Synthesis, 17th Jan, 2017 from 9-5pm in Ramada Powai Hotel & Convention Centre, Mumbai, India.